Here at Alpha Rings we ensure that every ring we sell has been made with only the best compositions and the best processes to make rings that will look good for longer. Here is a run down on the materials that make up the bulk of our rings. Tungsten Carbide is an alloy containing Tungsten, the industry standard being around 85% Tungsten. This produces the best quality rings for a variety of reasons. If there is too much Tungsten in the ring, the rings can become quite brittle, and shatter or crack easily. If there is not enough Tungsten, then the ring will scratch far more easily. Our Tungsten rings contain 85.7% Tungsten. Guaranteed. Tungsten Carbide is a unique metal. It has an incredibly high melting point, nearly 3000 degrees. It is also amazingly hard, registering around 8.5 on the MOHS scale of hardness. This effectively means only diamond can scratch it! This makes it the perfect material to make scratch resistant men’s rings and bands. A binder is during the production process of Tungsten Carbide. Generally the binder is Cobalt or Nickel. Cobalt is cheaper but this will react to your skin and tarnish the ring. You do not want your Tungsten Wedding ring to go this way. We only use Nickel binder. – They can provide the exact composition of the ring. – Website pictures must be clear and of good quality. We have a tick next to all of the above! * Nickel release tests make sure that a certain standard is met for the amount of nickel that is released from the product over time. If this extremely low limit is exceeded, the Nickel release test is failed. All our rings pass the Nickel release testing. We are a proud Australian retailer of mens rings located in Adelaide. We only sell mens rings, and we only sell rings in fashion at competitive prices! Any questions, contact us and we will respond within 24 hours. Black Ti™ is the patent process that the Edward Mirell parent company developed, and now use. Importantly, and unlike almost all other so called “black titanium” on the market, it is not electroplated or coated. 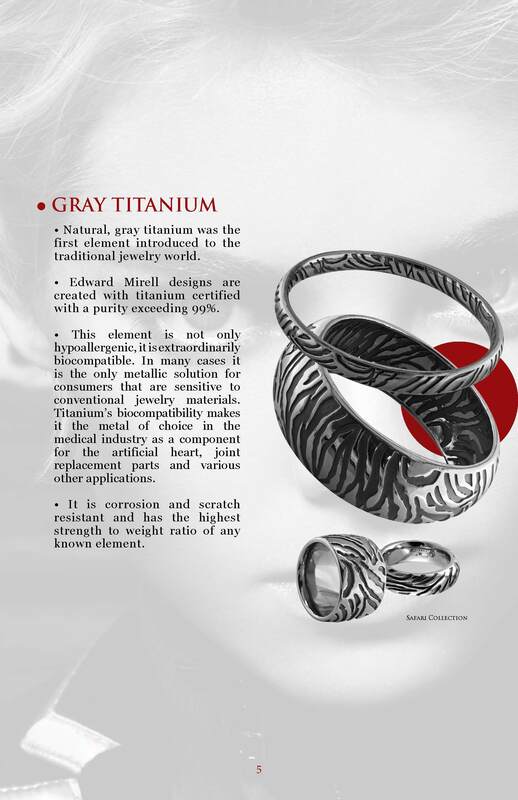 Normal grey titanium is subject to enormous heat and it actually changes at the molecular level. This makes Black Ti™ the perfect material for making jewellery. Unfortunately because this is a patent process, many competitors have attempted to make similar processes, but unfortunately have not managed to capture the qualities that make Black Ti™ so highly sought after. When you purchase Edward Mirell, you are purchasing the one and only Black Ti™. Ceramic rings have gained in popularity in recent years. Ceramics hold many advantages over traditional metals such as gold, silver and platinum. But exactly what is a ceramic ring? Ceramic Zirconia has very high melting points. Ceramic is made from powder that is fired under extreme temperatures and pressure to create the amazing rings you see before you. The benefits of Ceramic are the price – it is very cost effective, particularly in comparison to Gold and Platinum. It is very strong and durable, making it more scratch resistant than most metals. Ceramic is higher on the Mohs scale of hardness than Gold, Silver and Platinum, but not Tungsten. Our Cobalt rings are absolutely spectacular. Cobalt alloy is a completely hypoallergenic material which is often used in medicine due to its compatibility with the human body, or “bio-inert”. The alloy is Cobalt – Chromium – Molybdenum. This creates a scratch resistant metal which is a brilliant white colour, which is often compared to Platinum. Dont be confused with cobalt that is in Tungsten rings, cobalt in this form is completely safe and has been used in medicine and dentistry for years. It is also harder and more scratch resistant than Titanium, but softer and less scratch resistant than Tungsten. Cobalt Chrome rings wont lose their lustre over time and are very resistant to tarnishing. Cobalt rings should not shatter. We find that customers that purchase the Cobalt range are astounded at how good they look, particularly those clients that love the “whiteness” of platinum. Tungsten is “greyer” or more gunmetal than Cobalt, and Cobalt is “whiter”.